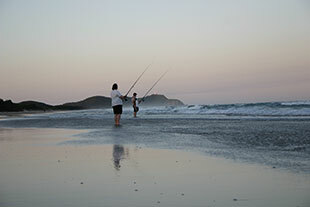 The marine park offers something for all recreational fishing enthusiasts – offshore, estuary, rock or beach fishing. Of course, always check the zones and management rules in the Cape Byron Marine Park Zoning Map and User Guide before you head off. alternatively, download the Avenza Maps app on iOS or Android. Once the app is installed, go to the Avenza Map Store and search for “DPI Fisheries" to find all available maps. Further guidance on how to download Avenza maps can be found here. Some of the content on this page may not be fully accessible. To obtain an accessible version of this content contact the author marine.estate@marine.nsw.gov.au. Tropical and temperate species overlap offshore at Cape Byron. Teraglin, spotted mackerel, wahoo, samson fish, pearl perch and tusk fish (to name a few) mix with southern species such as tailor, snapper and mulloway. Waters in the vicinity of the Mackerel Boulder are closed to all fishing from 1 May to 31 December each year. Pelagic fish, such as Spanish mackerel are targeted, during the open season (January to April). Warning: Caution is required when heading offshore from the bar at Brunswick Heads. Find out about fish aggregating devices (FADs) in the area. Estuary fishing and crabbing in the Brunswick River are very popular. The rock training walls provide a platform for fishing for seasonal mulloway, bream and tailor. Troll, spin or bait fish for flathead scattered throughout the estuary. Fish for juvenile giant trevally (GTs), bigeye trevally and mangrove jack. Bass may be caught in the Brunswick's upstream stretches. Pump nippers along the sand flats during low tides in the habitat protection area. Spearfishing is not permitted in the Brunswick River estuary or in the Fisheries Management Closure (Spearfishing), which extends 1 km to the north and the south of the river mouth and 400 m offshore. Most of the marine park beaches are open to fishing and offer great opportunities. Large green back tailor frequent many of the beaches. Take with spinning lures, ganged garfish or on large cut baits, such as bonito. Whiting, bream and flathead fishing is excellent in summer. For mulloway, try spinning large minnows or feathers from the rocks, or soak big baits, such as large beach worms, mullet or tailor fillets, or try squid from the beach in the evening. Several charter fishers operate in the park. Visit Destination NSW for more information. Before going fishing, pick up a copy of the Cape Byron Marine Park User Guide (PDF, 525.8 KB) and Zoning Map (PDF, 1171.16 KB) online or from your local bait and tackle shops, tourist information centre, or from the marine park office or on your mobile device. Some species are protected from fishing and collecting in habitat protection zones. Check out which species you can take in habitat protection zones of Cape Byron Marine Park. Spearfishing is not allowed in and around the Brunswick River Estuary or within sanctuary zones. NSW Department of Primary Industries restrict spearfishing in some other areas. You can transit through sanctuary zones with stowed fishing gear, but make sure fishing lines aren't baited and no part of the line is immersed in the water. If you have fishing gear on your boat when you stop in a sanctuary zone for a picnic or a break, you must have your fishing gear in an unrigged state. That means no part of the fishing line is attached to any hook, artificial lure, artificial fly, swivel or other piece of fishing tackle (other than the reel the fishing line was spooled on). NSW fishing rules and regulations, including bag and size limits, also apply when fishing in marine parks. Most people fishing in NSW waters need to pay the NSW recreational fishing fee. Make sure you fish safely.